Community Involvement | Design Lines, Ltd. Ever wonder what happens to all those samples? We have a huge library of fabrics that is constantly being updated. So what happens to the old when we need to bring in the new? Our discontinued fabric books find second lives as learning tools at Interior Design Program at Meredith College or art supplies at Durham’s Scrap Exchange. 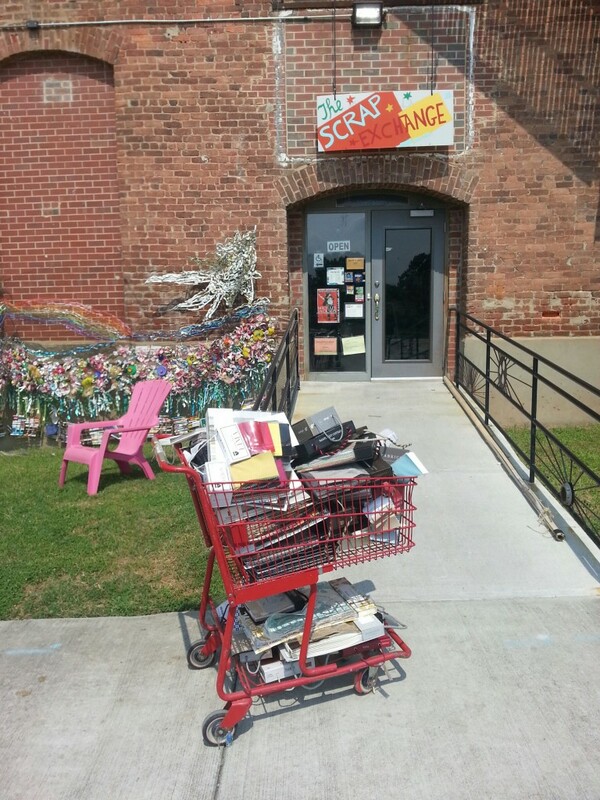 The Scrap Exchange is a not-for-profit that emphasizes creative re-use of all sorts of things. Their warehouse in Durham is a wonderland of discarded treasures – from bubble wrap to roof tiles and everything in-between. They even offer children’s classes and a little shop showcasing local handmade goods. It’s the perfect place to be inspired for your next project! These days the trend is to buy local. It seems farmer’s markets, backyard fruit and vegetable gardens and even chicken coops are popping up everywhere. For us this has translated into clients requesting us to use local resources, American made products, and even using reclaimed material. This lifestyle not only enriches everyday life but also simplifies it by knowing where and products are made. 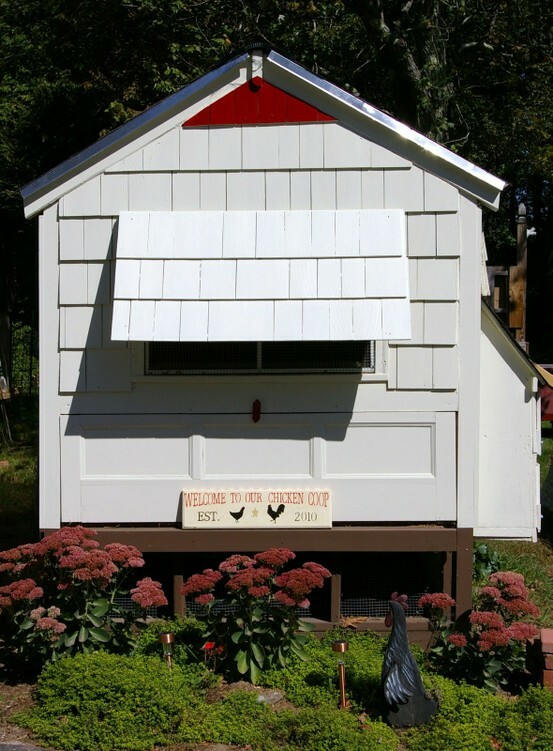 Raleigh has even embraced this localization with a Chicken Coop Tour that showcases all the coops in their glory! Katerina’s family receives a box every Thursday with fresh seasonal produce from local farmers. This is perfect for the working family who doesn’t always have time to stop by the supermarket. This box is left on the front porch; it is always a surprise to see what produce is inside. Can’t get enough produce? 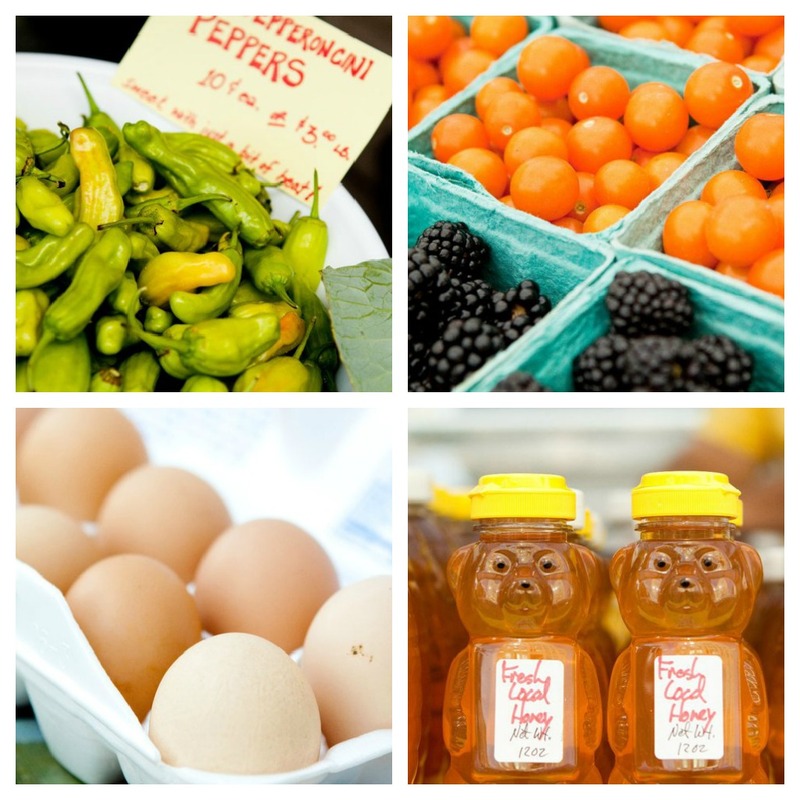 Surrounding area farmer’s markets provide endless options for your culinary desires. 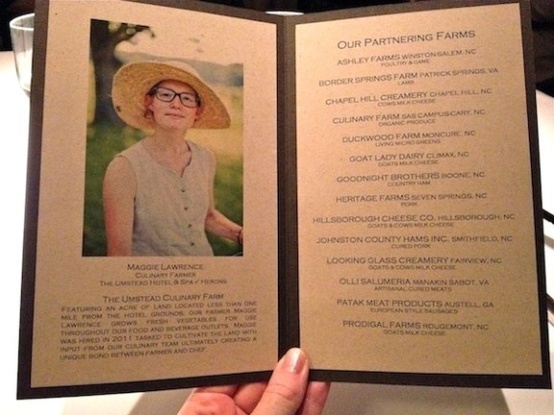 Local restaurants in and around the surrounding Triangle area even promote that their ingredients come from local resources. Rob and Judy recently ate lunch at the Umstead and Herons has a menu devoted to everything local. Brittany’s farmers market is in Carborro. She particularly loves the Chapel Hill Creamery Cheese Products and their Fall flowers – Dahlias and celosias are her favorites. The crew at Design Lines doesn’t think this trend will end anytime soon, if anything we predict this trend will grow. How do you buy local? 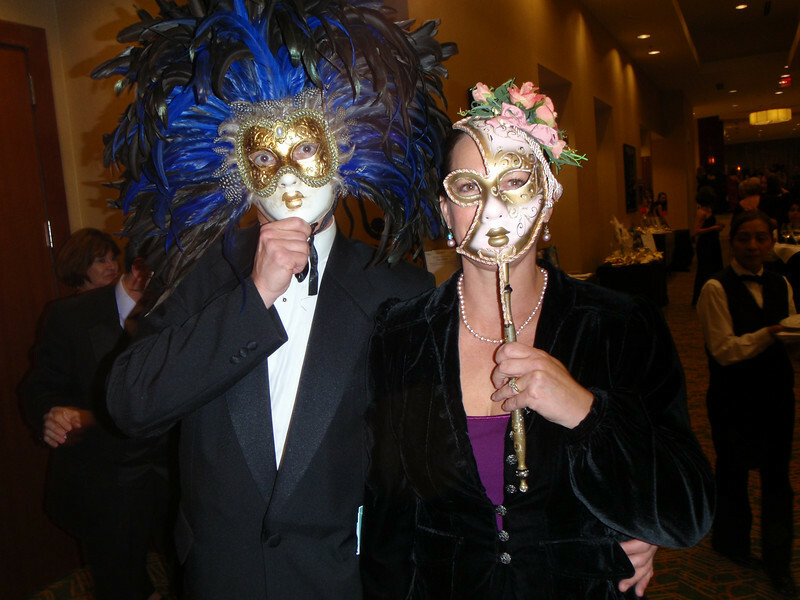 This winter the Design Lines team donated their time and creativity to design Carolina’s Ballet Annual Mardi Gras Ball. Our vision was to create a memorable and glamorous event using color combinations of turquoise and white, while bringing in peacock feathers and lime green ribbon as fun accents. The fascinator (above) was at each place setting and as the night went on many party goers pinned them to their formal attire. 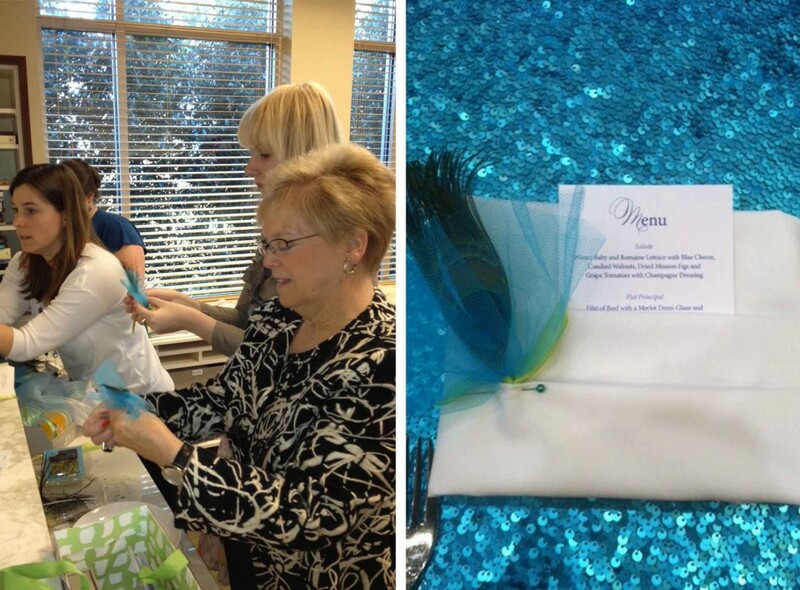 Thanks to Michele Weathers at Carolina Ballet, Tricia Phoienx & Susan Garrity for allowing us to be a part of the Ballet Ball! Picture above are party goers showing off the beautiful masks. One More Nursery for the Portfolio….. The Chancellor’s house at NC State is coming along nicely, and we’re starting to think about the decorative touches that will make this house feel like a home. In such a large house, with both public and private areas, we had to get creative about where to find the right pieces. We’ve mined the University Archives, Gregg Musuem, and the work of local artists to find the perfect collection worthy of such a grand building. 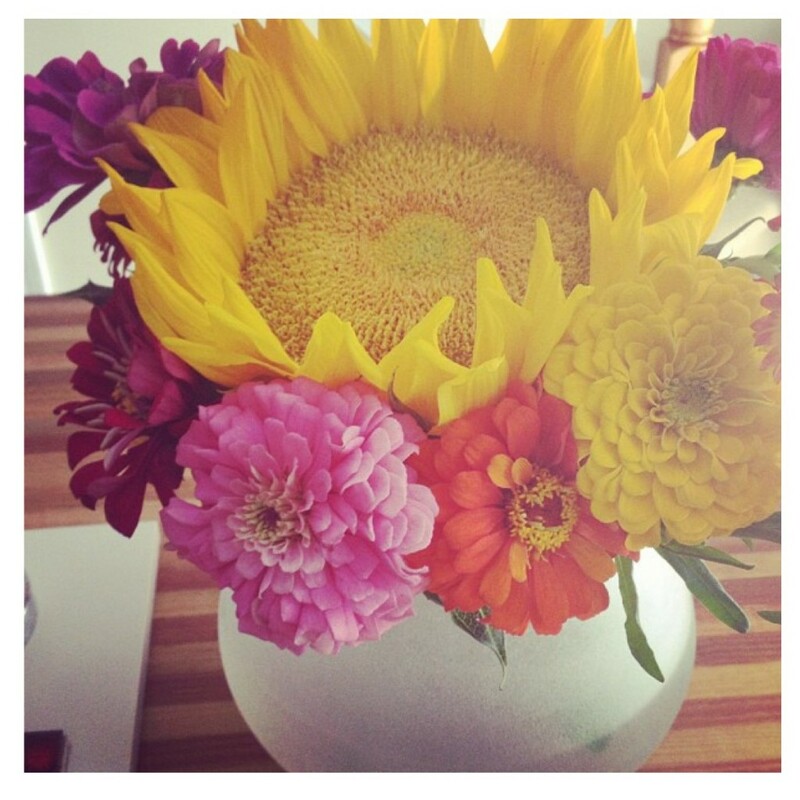 Below are some pieces that have inspired us…. One of the best sources of art for the Chancellor’s house is the Gregg Museum at NC State. 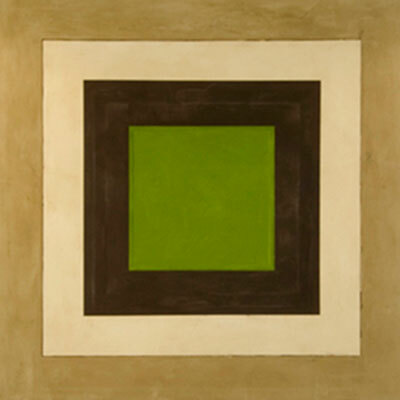 We will adorn the walls with several loans from their permanent collection. Some of my favorite pieces are the photographs of esteemed North Carolina Photographer Elizabeth Matheson (above). Her work is currently in a show at the North Carolina Museum of Art, and we hope to place similar work on the main floor of the Chancellor’s House. Another great artist in the Gregg Collection is George Bireline, whose abstract expressionist painting (above) will look amazing in the Chancellor’s study. Another great source of art will be reproductions made from the University Archives. This vast collection includes all sorts of wonderful images. 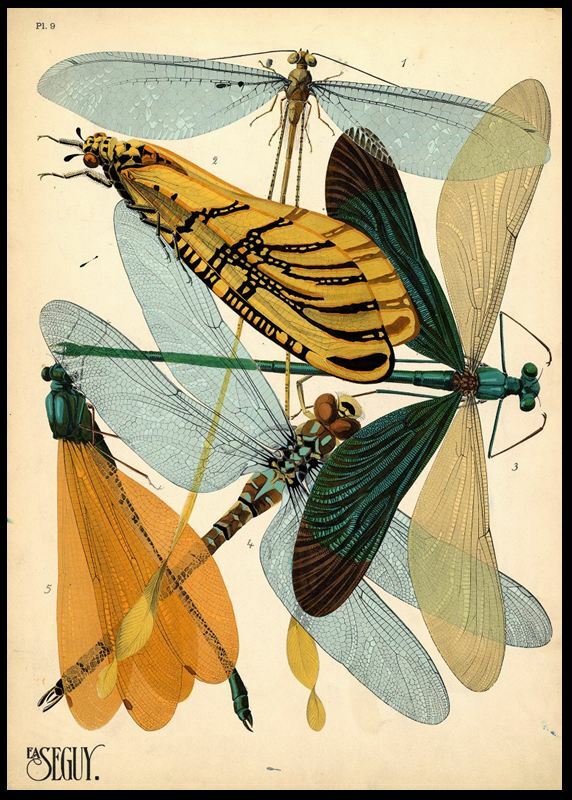 An illustrated Entomology book by E.A. 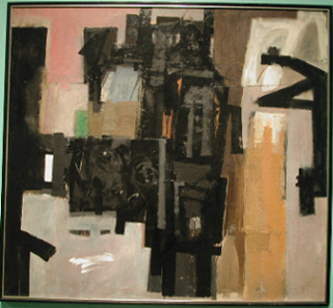 Seguy (above) is one of our favorite finds. These large prints of insects and butterflies are striking. 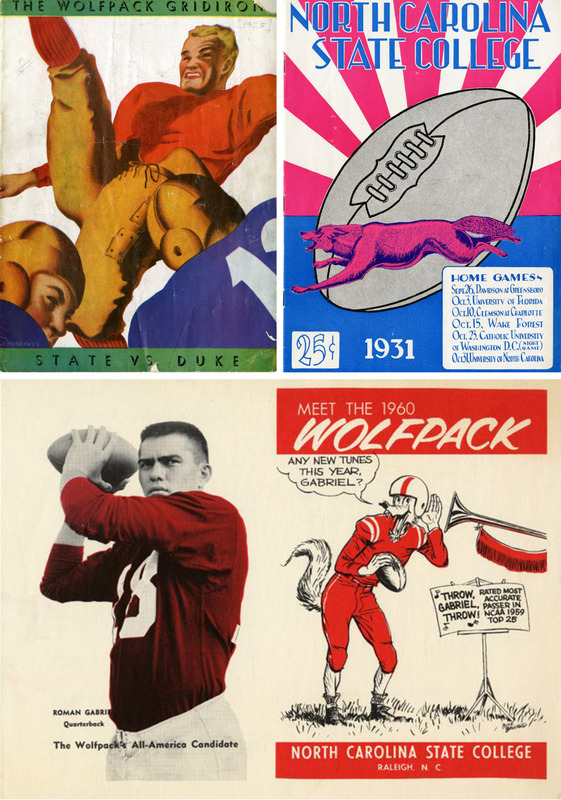 We also discovered the archive’s collection of printed sports memorabilia. We’d love to incorporate some of this fun and colorful artwork. 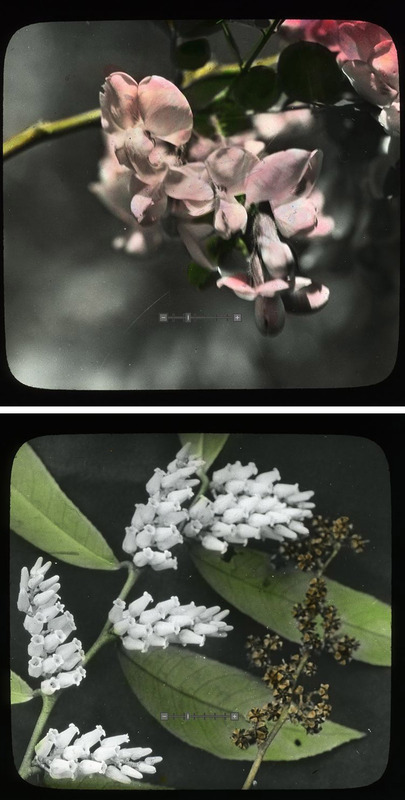 The university also has an impressive collection of glass slides from botanist B.W. Wells. 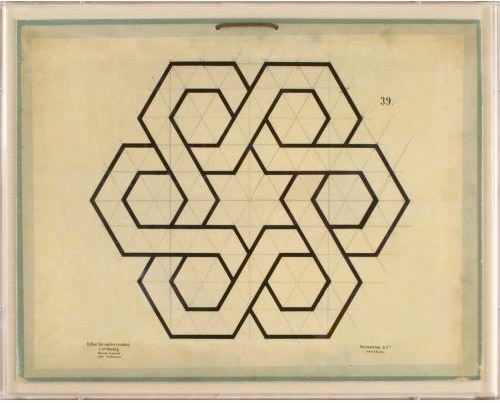 He used these hand-colored slides to instruct his students on the biodiversity of natural ecosystems. These slides can add a touch of beauty to the house, while also bringing to mind NC State’s role in the sciences. One of our main goals was to incorporate the work of local artists. Below are two examples of the artists who have inspired us, and who we hope to work with. 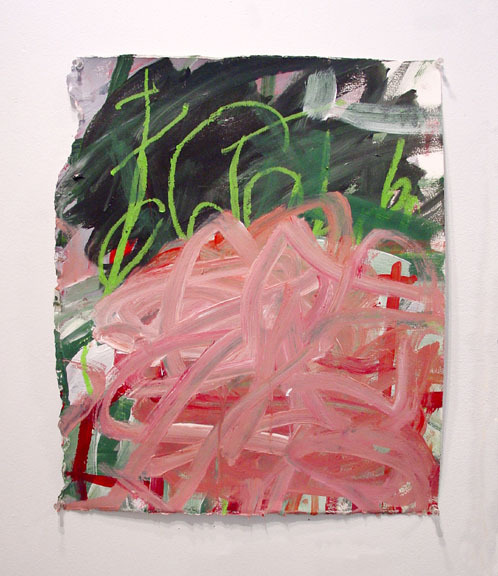 Ashlynn Browning (above) is a talented painter based in Raleigh. Her bold, colorful paintings are masterfully produced, and can add a punch of color to any wall. Steve Staresina (above) is a local artist who creates large-scale frescoes. He is creating a large-scale work commissioned specifically for the Chancellor’s Parlour. To round out the collection, we’re looking to additional sources to add diversity to the collection. We love the (above) wall piece from Ironies. 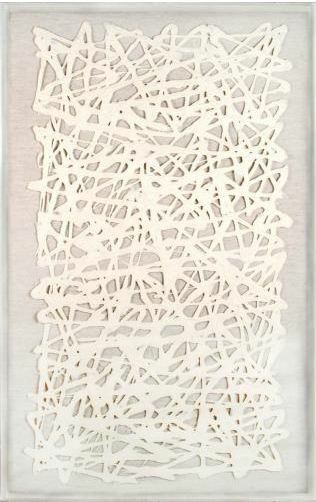 Cast resin painted with a metallic pigment make this wall-sculpture look like formed metal. Another great source for decorative pieces is Natural Curiosities. 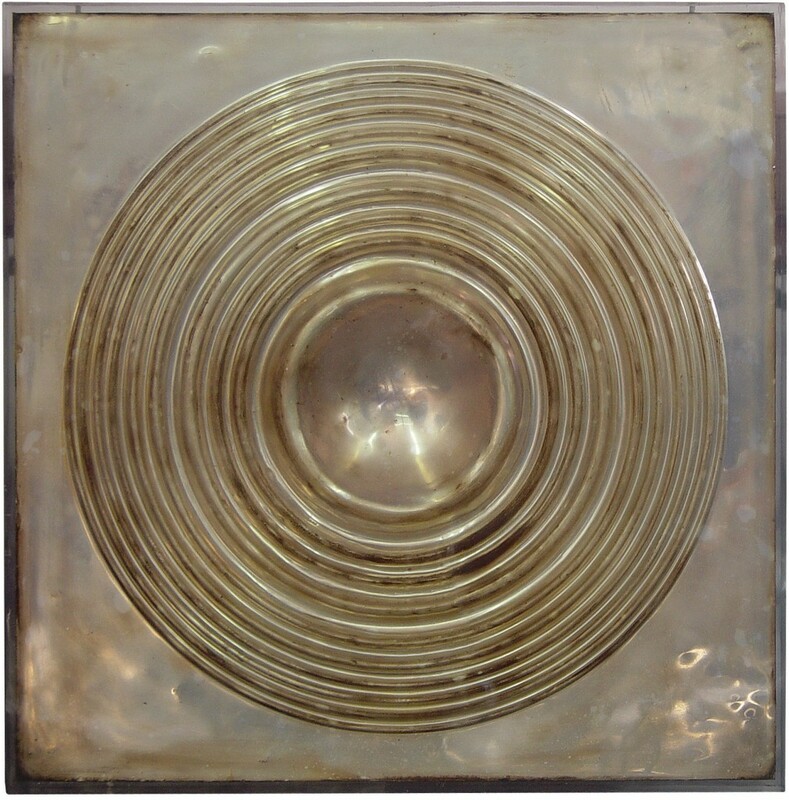 They offer many interesting works in a variety of formats, and can add a sophisticated touch to any home. The abstract paper collection (above) is one of our favorites. The Jean Baptiste Collection (also from Natural Curiosities) is another collection we’d like to use in the home (above). 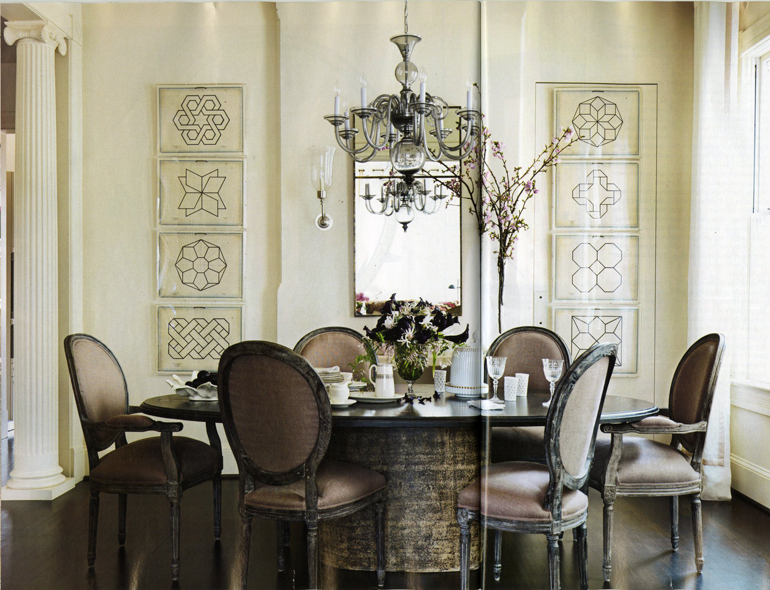 The same set of prints was featured in this month’s issue of House Beautiful magazine (below). We look forward to updating you as the art collection continues to come together. 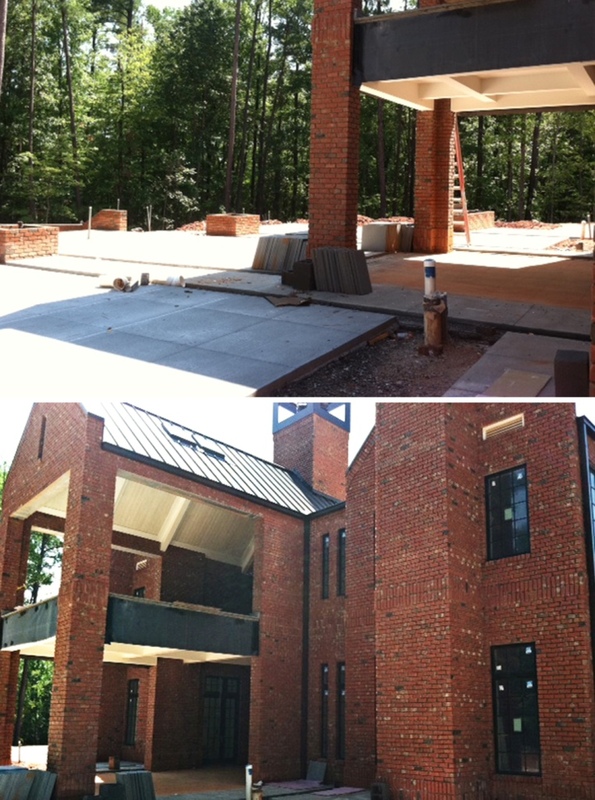 The Chancellor’s House at North Carolina State University is really starting to take shape! We wanted to share some of the most recent photos with you. The exterior is beginning to look awesome with the addition of concrete patios and planter boxes (below). When all the landscaping is complete, it will be an inviting backyard retreat, and a great place to hold university functions. Since we last posted, the interior has undergone major transformations with the addition of drywall, paint, and cabinetry. Below, you can see one of the house’s 8 fireplaces, newly fitted with its stone surround and wood mantle. 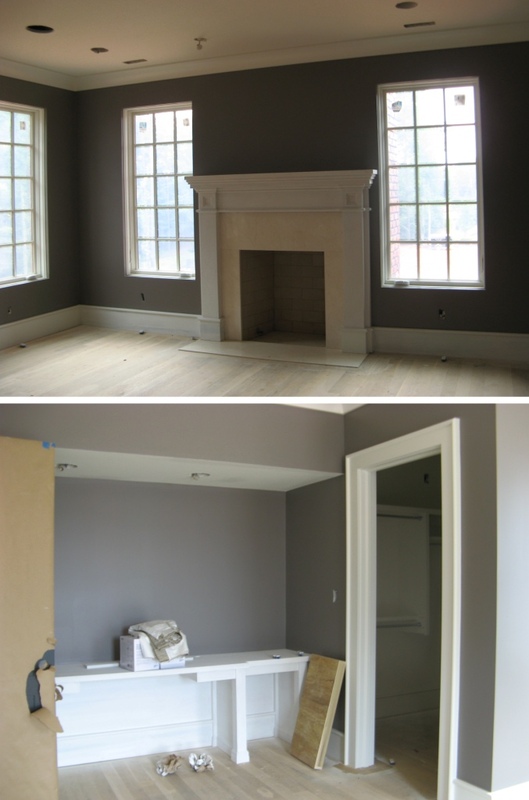 This room will serve as the living quarters for the Chancellor’s distinguished guests. A built-in desk will make it a comfortable place to work. 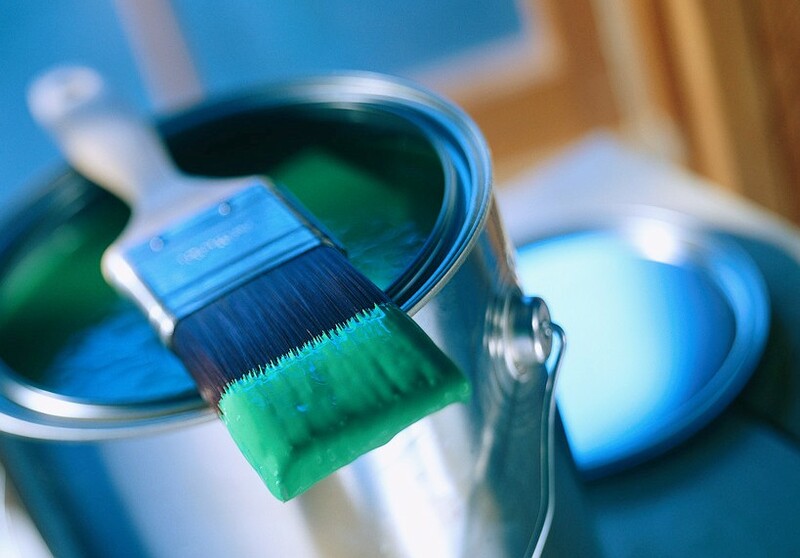 One of the biggest transformations happened when the staircase was painted. 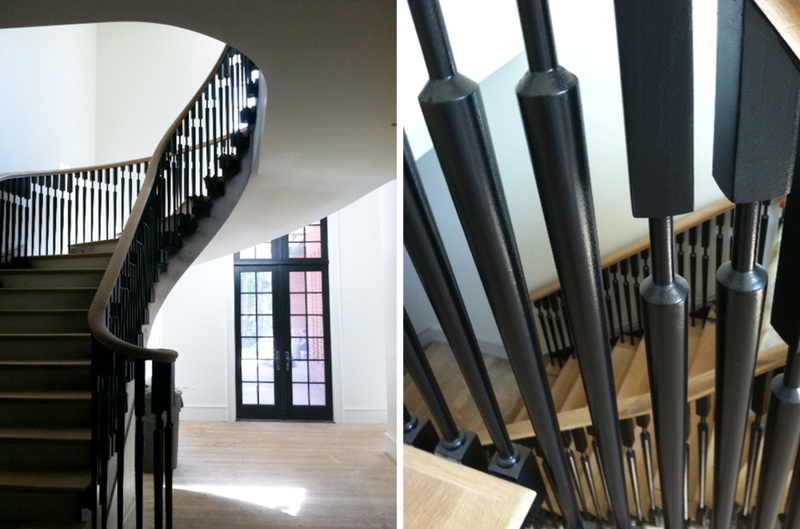 The sensous curves of the stair are newly accented by black picketts lining both sides. It looks really smart! 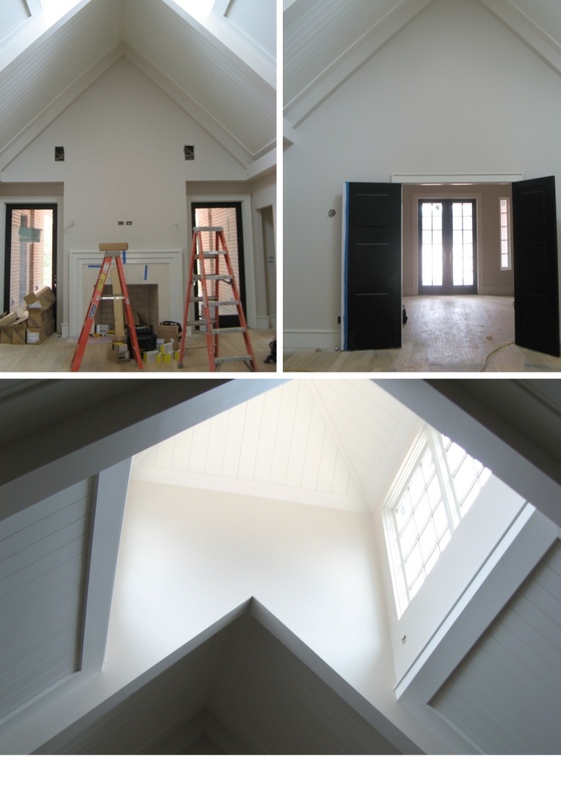 Upstairs, work is nearly complete on the Chancellor’s family room, a lofty space with tons of natural light. Below, you can see a few of the home’s finished doors. All the doors will be painted black and accented with polished chrome hardware. The floor stain was finalized last week (below). 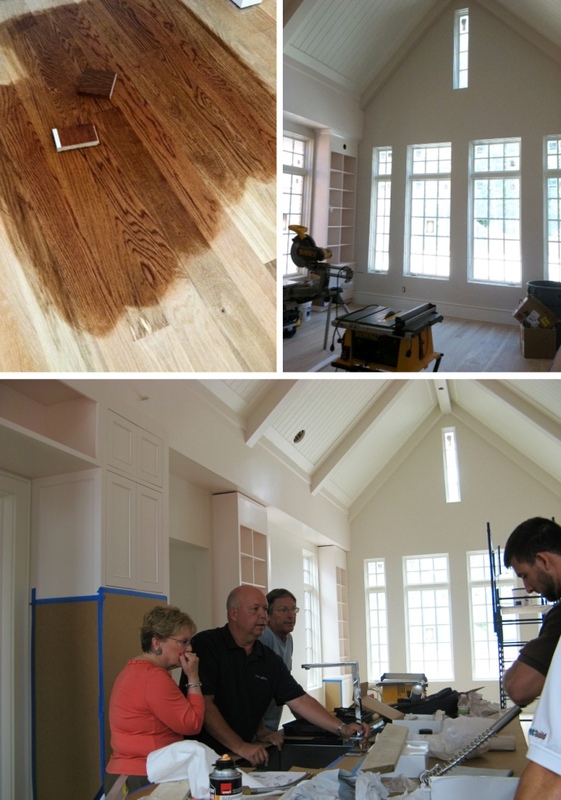 Applied over a beautiful oak floor, the timeless color we chose will complement the mahogany woodwork throughout the first floor. 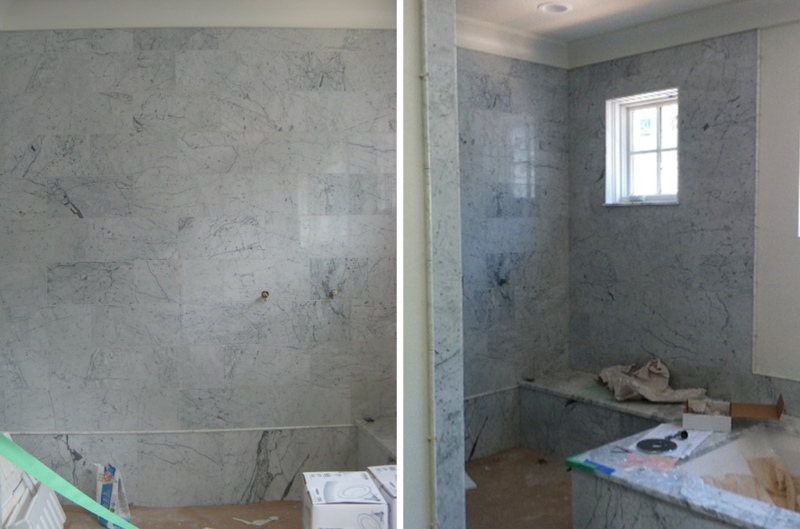 The master bathroom is starting to come together – marble tile of different sizes is being applied throughout. Glass panels for the shower will be one of the finishing touches. There are so many new things to see everytime we visit the house. It’s exciting to see how quickly things are coming together – but there is still a lot to be done! 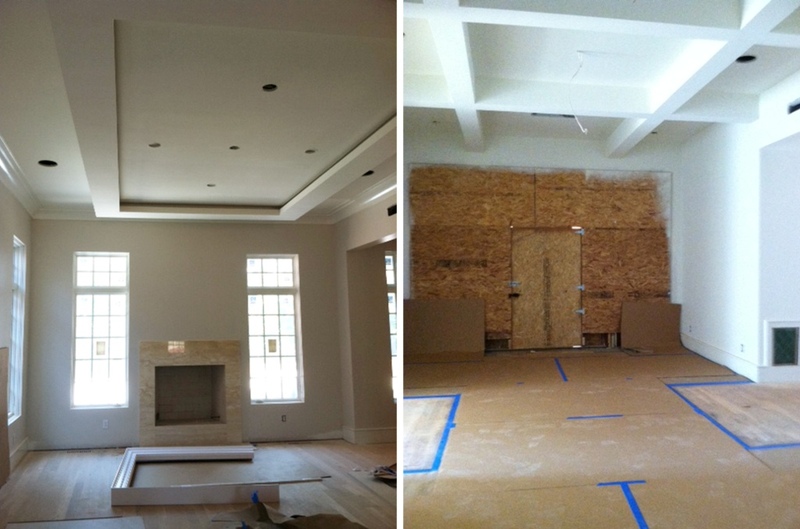 Above, you can see the fireplace in the Dining Room waiting for its wood mantle (above left). One of the most impressive features of the house (yet to be installed) will be the front door and flanking windows. Currently, a temporary plywood partition protects the opening (above right). I can’t wait to see how beautiful the entrance hall looks when it’s finished! 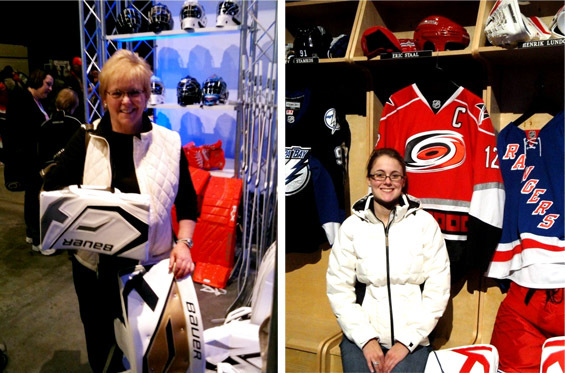 If you’re a hockey fan then you’ll know, Raleigh hosted the NHL All-Star Game this past weekend. For three days Raleigh rolled out the red carpet and welcomed all the fans and players of the NHL. Avid hockey fans, Judy and Hilaire take in some of the excitement at the Fan Fair. Who says designers can’t be hockey fans! 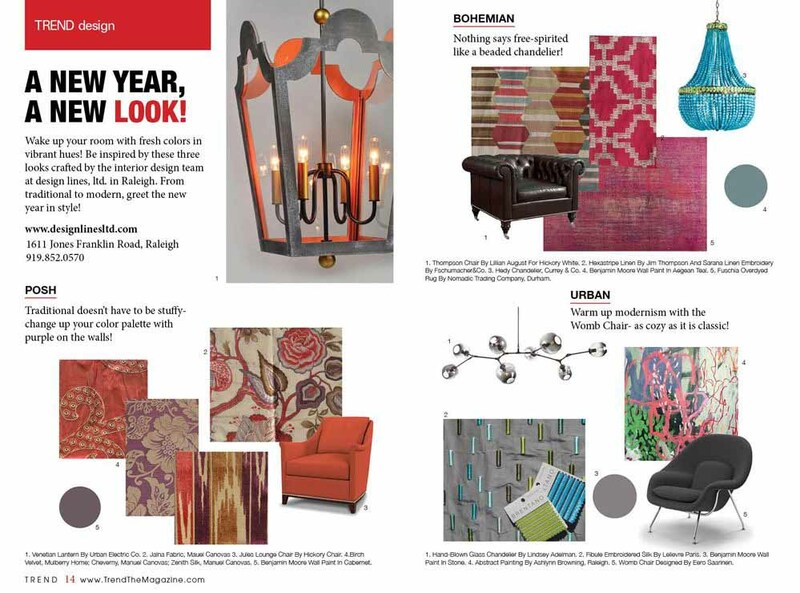 We are honored to be a part of the 2011 January edition of STIR – the online magazine for Sherwin Williams. The magazine highlighted our pro-bono work with Creedmoor Elementary School (CES). Thank you for sharing our story. We believe everyone should have a stimulating environment to live, work and play in, and CES is no exception. Click here to read the complete story. When Judy isn’t working with clients or at the studio, she is often times giving back to the interior design profession. After fourteen years of being a site visitor for the Council for Interior Design Accreditation (CIDA), Judy was appointed to a three-year term on the Accreditation Commission for CIDA. CIDA is an accrediting body that reviews and accredits academic collegiate level interior design programs. The Design Lines team is always amazed by Judy’s commitment to education and her passion for the emerging interior design professionals. Front Door Greetings From Design Lines, Ltd.
For the past few days Molly and I have been speaking to the students in the “Housing & Interiors” classes at Needham Broughton High School. We first heard about the program about three months ago and have been donating discontinued library resources for the students classroom projects ever since. As we got to know Ms. Parsons and the program, we jumped at the opportunity to share and give our insight into the interior design profession with the students. We hope this is the start of a great community partnership! We touched on everything from where to look for design inspiration, characteristics of an interior designer, different career paths within the profession, and resources to utilize when applying to colleges with interior design programs. 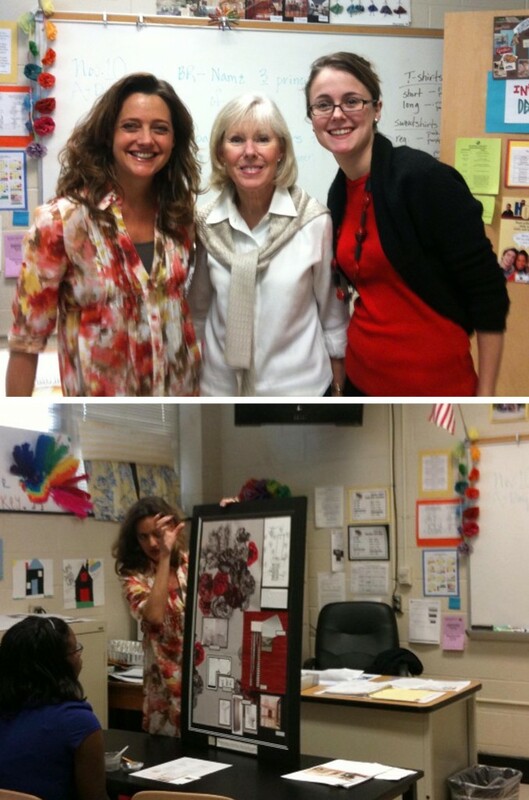 Above: Molly sharing a presentation board to the students. Thank you Ms. Parsons and all the students! You rock. 2012 Is A New Year!